There is simply nothing that can match the beauty and elegance of Hatshepsut temple. It is an ancient example of pure visual architecture the temple is able to reach the highest level of perfection and is one of Egypt’s incomparable monuments. It was built by Queen Hatshepsut during the 18th dynasty in the new kingdom on the west bank of the Nile under the cliffs of “Deir El-Bahari”. 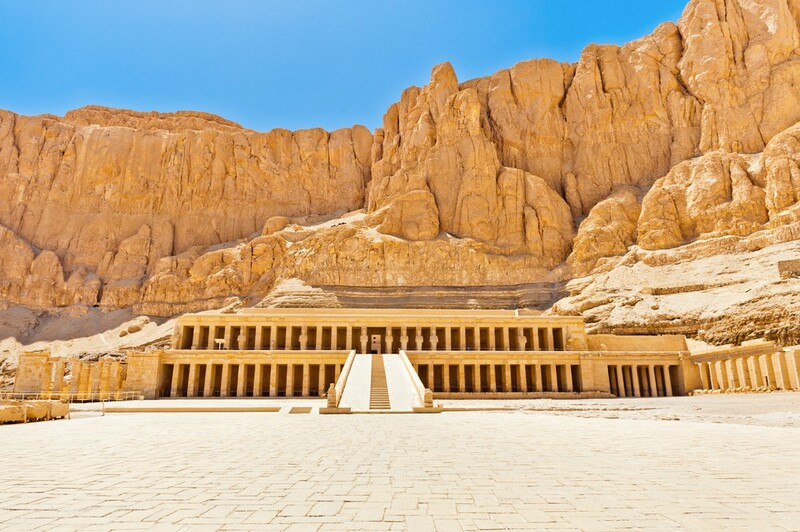 its purpose was to become the mortuary temple of Hatshepsut and was known as Djeser-Djeseru (Holy of Holies). The temple was the neighbor of the Mortuary temple of Mentuhotep II which was used as a primary model. It was dedicated to the god Amun and Hatshepsut herself who was successful in immortalizing her name through the ages. Hatshepsut(1479-1458 BCE) was the wife of Thutmose II and of the most powerful female Pharaoh in Ancient Egyptian History. She was the wife of the God Amun a powerful position at that time When her Husband King Thutmose II died, she became the queen-regent to her Husband son from a new woman Thutmose III but she soon took over the throne. The reign was one of the most peaceful and prosperous as she improved the socioeconomic status to the highest level by creating lucrative trade deals with the land of punt and expanded the Karnak temple. The temple was designed by Hatshepsut’s chancellor and royal architect Senenmut in 1479 BC about 17 miles northwest of Luxor in the western side of the great capital of Egypt in the new Kingdom Thebes. It took 15 years to truly personified Hatshepsut glory to the fullest light. The design of Hatshepsut temple was very unique as it’s the closest Egypt came to the concept of Classical Architecture (A style of Architecture driven from Greek & Roman origin). It was a turning point from the megalithic geometry of the Old Kingdom to the style of the new kingdom which enjoyed active worship and sanctuaries to honor the gods related to her afterlife. The temple consists of three levels; it also contains the home of two statues of Osiris, sphinx avenue and colonnades with Square Pillars. It holds the shrine of Hathor that has a hypostyle hall with twelve beautiful columns and the chapel of Anubis that has a hypostyle hall with fluted columns, there is also a sanctuary of Amun. One of the main highlights of the temple is the magical wall carving and descriptions that detail and document the important events of Hatshepsut like her expedition in the lands of punt and her relation to the god Amun. One of the rare information on the temple is that the temple is home of an astronomical alignment similar to one at the temple of Abu Simbel. Egypt has a lot of magnificent tourist attractions and great history, so we recommend to discover all Egypt has to offer through our Egypt tour packages, or Nile cruises, check them and choose your dream vacation.